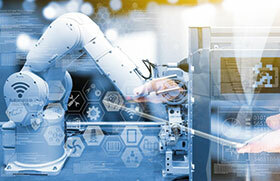 Predictive maintenance should be considered essential in any digitalisation strategy aimed at Industry 4.0 migration towards the smart factory ideal. The ability to track machine performance and anticipate failures before they occur helps manufacturers to improve overall equipment effectiveness and reduce wasted time and costs. A leading solution for predictive maintenance is condition monitoring; however, collecting machine performance metrics is only the beginning. The ability to interpret and communicate this data is essential for system reliability, and this is where machine learning comes into play. A condition monitoring solution with machine learning removes human error from the equation and makes predictive maintenance solutions smarter and more effective. Predictive maintenance is the process of tracking the performance of crucial machine components, such as motors, to minimise downtime needed for repairs. Predictive maintenance enables users to anticipate when machine maintenance will be needed based on real-time data from the machines themselves. Because of this, predictive maintenance can help reduce machine downtime, increase mean time between failures (MTBF) and reduce the cost of unnecessary machine maintenance and spare parts inventory. Traditionally, plant managers relied on preventative maintenance schedules provided by a machine’s manufacturer, including regularly replacing machine components based on a suggested timeline. However, these timelines are only estimates of when the machine will require service, and the actual use of the machine can greatly affect the reliability of these estimates. On one hand, this means that you could be paying for unnecessary maintenance and replacement parts that are not needed. On the other hand, many things can go wrong between scheduled maintenance visits. For example, if bearings wear prematurely or a motor overheats, a machine may require service sooner than anticipated. Furthermore, if a problem goes undetected for too long, the issue could escalate further damage to the machine and lead to costly unplanned downtime. Predictive maintenance helps avoid these problems, saving time and money. Condition monitoring plays a key role in predictive maintenance by allowing users to identify critical changes in machine performance. One important condition to monitor is vibration. Machine vibration is often caused by imbalanced, misaligned, loose or worn parts. As vibration increases, so can damage to the machine. By monitoring motors, pumps, compressors, fans, blowers, and gearboxes for increases in vibration, problems can be detected before they become severe and result in unplanned downtime. Vibration sensors typically measure RMS velocity, which provides the most uniform measurement of vibration over a wide range of machine frequencies and is indicative of overall machine health. Another key data point is temperature change (i.e. overheating). Machine learning takes this information and automatically defines a machine’s baseline levels and sets thresholds for acute and chronic conditions, so you know in advance – and with confidence – when a machine will require maintenance. The most effective predictive maintenance solutions will continuously monitor machines for critical changes, including changes in RMS velocity, high frequency RMS acceleration, and temperature. Changes in these conditions are leading indicators of future failure. A continuous monitoring solution will pick up on these in real-time and allow for timely remedial action. After mounting the vibration sensor, most sensors require you to collect enough data to establish a baseline. Machine learning removes the chances of human error by automating the data analysis. A condition monitoring solution with machine learning will recognise the machine’s unique baseline of vibration and temperature levels and automatically set warning and alert thresholds at the appropriate points. This makes the condition monitoring system more reliable and less dependent on error-prone manual calculations. ability to monitor machines in inconvenient locations allows for more comprehensive monitoring and increased reliability throughout the facility. When a vibration or temperature threshold has been exceeded, a smart condition monitoring system should provide both local and remote indication, such as sending a signal to a tower light in a central location or sending an email or text alert. This will ensure that warnings are addressed quickly regardless of whether the machine is within the sightline of an operator. A condition monitoring solution that logs the collected data over time enables even more optimisation. With a wireless system, vibration and temperature data can be sent to a wireless controller or PLC for in-depth, long-term trend analysis. Monitoring vibration and temperature using machine learning improves reliability, reduces unplanned downtime, and saves maintenance costs. It is also an easy way to start making better, data-driven decisions about machines and transforming a plant facility into a smart factory.